This tablet from the house of South Korea's Electronics Giant - Samsung is code named as Galaxy Note 10.1 (2014 Edition). This tablet from Samsung is available in three variants viz; Wifi Only, 3G with voice calling & 4G with voice calling. 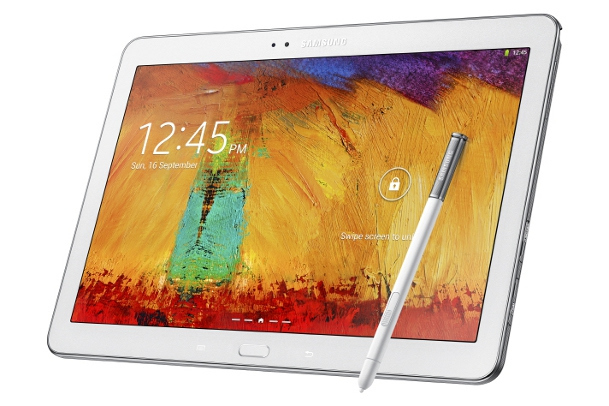 Samsung Galaxy Note 10.1 (2014 Edition) looks very stunning and packs in some great specifications also. This tablet sports a 10.1 Inch Super Clear LCD Capacitive touch screen with multi touch upto 10 fingers. Samsung Galaxy Note 10.1 looks vibrant in WQXGA display which packs in a resolution of 2560 x 1600 Pixels, ~299 ppi pixels density ( which is almost 300 ), 16 M Colours. Dimensionally this slim tablet from Samsung measures 243.1 x 171.4 x 7.9 mm (9.57 x 6.75 x 0.31 in), it weighs 535 gms (1.18 lbs) which is really light keeping in mind a 10.1 inch tablet & there are two basic colours to select from Black & White. The name Note itself suggests that it will be accompanied by a S Pen Stylus & using it on a 10.1 Inch display will be a great experience. Samsung has also packed in Stereo Loud speakers. On the display front this tablet looks very elegant & technically Samsung has stacked it with some great performance. Under the hood Samsung Galaxy Note 10.1 (2014 Edition) holds a Quadcore 2.3 Ghz Krait 400 Processor (4G / LTE Model) & Quadcore 1.9 GHz Cortex A15 & Quadcore 1.3 Ghz Cortex A7 Processor (3G Model), Qualcomm Snapdragon 800 Chipset, Adreno 330 GPU, 3 GB of RAM. This is what I call a dream specification, either you want to multi task or play latest games this tablet will not disappoint you. Samsung Galaxy Note 10.1 (2014 Edition) will come out of the box with Android OS v4.3 (Jelly Bean). There are three variants in case of internal memory viz;16 GB / 32 GB / 64 GB & samsung has also sneaked in a memory card slot that supports upto 64 GB microSD card. The data connectivity aspect is loaded with Wifi, Wifi Direct, Wifi HotSpot, Bluetooth v4.0 A2DP, microUSB v2.0, USB Host. For positioning it features GPS with support for A GPS & GLONASS. On the rear panel Samsung Galaxy Note 10.1 (2014 Edition) is a 8 MP Primary camera with LED flash light, Auto focus, geo tagging, face & smile detection. This Primary camera is capable of clicking images of 3264 x 2448 Pixels resolution and record HD videos of 1080 P @ 60 fps. The secondary camera on the front panel is of 2 MP which can also record HD videos of 1080 P @ 30 fps & can be used for video chatting. Samsung Galaxy Note 10.1 (2014 Edition) stores in a non - removable Li-ion battery with a gigantic juice of 8220 mAh.